91 Super Mario dressup game! In the special edition of 7 Days a Skeptic, an unknown character types 'pasta sauce' into the computer to bring up the main menu. Entering the same phrase into the computer in the Captain's quarters brings up an email to Strong Bad, asking him how he types with his boxing gloves on. In the free flash RPG Adventure Quest, occasionally when a Guardian summons the Guardian Dragon, the dragon will say: "BURNINATE!!! (do not sue us please)"
Also, there was a Homestar Runner chat icon in the forum that you could choose but it has been removed. On Mogloween 2006, one of the randomly generated names for the houses was Trogdor. When you enter the cheat code 'sooo good' in single player, each unit that is killed will display a Teen-Girl-Squad-like death, which varies based on the type of unit that killed them. MUSKETEER'ED! and JANNISSARY'ED! are some examples. On page 9/10 of the manual, there are instructions on creating a new character. Whoever took the picture had named his character Homestar. One of the loading screen messages is "Ken loves Trogdor". One of the possible quotes that Nibbs can say while using her Fire Breath move is "Burninate!". On the Customize Skater option, one choice of shirt is titled "Star Runner"; it is a red shirt with a white star. In one of the game's rooms, there is a chalkboard that says "Look! A Homestar Runner reference!" In the third game in the series, when looking at a hut it is described as "A small thatched-roof cottage, suitable for burnination." In the first game, you have access to a computer labelled "Compy 386". In the city of Sanctuary, two citizens can be seen throwing knives at a dartboard. One of their lines is, "And THAT'S why they call me 'The Yellow Dart.'" One of Zer0's default skins is called "The Yellow Dart". In Flamerock Refuge during Tiny Tina's Assault on Dragon Keep, Mr. Torgue, the head of the Torgue corporation, serving as the town's gatekeeper, sends the Vault Hunters on a quest to blow up the ocean. In the free online trading card game Cardmaster Conflict, there is an avatar part called the "Gotta Have Blue Hair", which looks like Stinkoman's hair. The intro of level 25 tells the player "Time to burninate!" Counter-Strike servers with AdminMod installed occasionally display messages "(username) was burninated by Trogdor, er by (username)" and "Headshot! For good, and for AWESOME!" While racing, Crunch might say, "I burninated that chump!" and "Haha! Your car asplode!" While racing, Pasadena O'Possum might say, "Hey! This ain't a monster truck rally! That's SUNDAY SUNDAY SOMEDAY!!". Several Die-O-Ramas have titles similar to "ARROWED!" from Teen Girl Squad Issue 1 and/or comic. Among them are "SHARKED! ", "CROSSBOWED! ", "EXPLODEDED! ", "LIQUIDATED" and "JAWED!". "Explodeded" has an extra "ed" at the end, which refers to the 'D! from TGS. The font used for the Die-O-Ramas didn't have an apostrophe, so this was used instead. 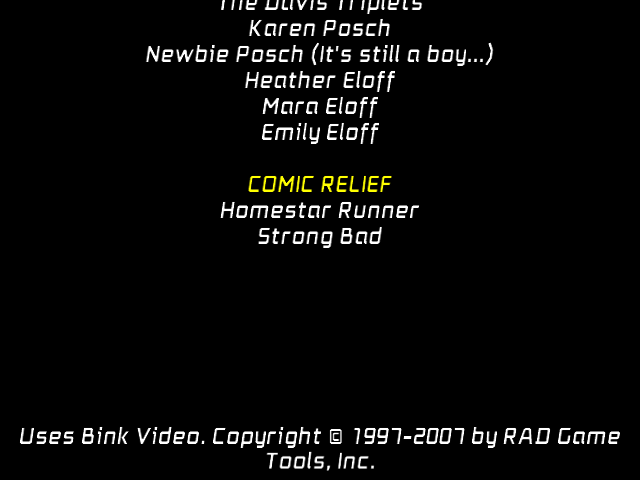 Homestar and Strong Bad are listed under the Comic Relief section of the game's credits. Partway through the American version of the game, there is a quiz on basic game knowledge. One of the (wrong) answers to a multiple-choice question is "Parts Burninator". There is also a gun called the "Homing Star"
If you defeat the alien mothership from Shockwave's Cyborg Livestock from Outer Space, the end text says that the ship "asplode," just as your head does in the game StrongBadZone. One of the default sires' name is "Homestar Runner". This diner's going to the moooooooooon! One of the secret levels is titled Everybody to the Limit. The description is: "Can you handle everything and the kitchen sink? This one's going to the moon!!" One Axe-type weapon is called the "Strong Bat", and its description is given as "Hey Sdeve!" One of the names you can name your Toon is Fat Dudley. During the monologue preceding the ToonTask for shutting down the Sellbot Factory, the store owner, Coach Zucchini says that the toon can refer to him as Coach Z. In one of the Sneevil Box Quests, you kill a sneevil and it gives you a random password. One of these passwords is "Burninate", an obvious reference to Trogdor. In the blacksmithing skill mini-game, Yulgar may ask you to craft such items as "Moist Letter Opener of Burninating." One of the Warrior sayings is "Douuuuuuuuble Deuce!" In the Design Notes for May 2nd, 2008, the game programmer Rolith complains that "Nobody Likes his style..." This is a possible reference to Nebulon. During Mogloween '09 (the game's halloween event), an unlockable mask, "Big Bad Luchadore Mask" is a pretty clear shout out to Strong Bad's face. The same mask can be bought from Cysero's Superstore of Savings. The "Fire Dragon Spirit" attack on the Dragonlord and Evolved Dragonlord armor applies a Damage-Over-Time effect called "Burninate!". One of the decorations is a "Thatched Roof Cottage". The description also recommends, "Just be careful placing it too close to fire dragons. It would be tragic to accidentally burninate your thatched roof cottage." This homemade parody of Everquest, found at Albinoblacksheep.com, allows one of the characters to summon Trogdor the Burninator. In the zone Inktu'ta, The Unmasked Chapel, there is a monster called "Cursecaller Fhqwhgads". You can see a picture of it here. Within the game's files, the special attack of the flare gun is called "Burninate All The People". Listed in the credits, listed under "SPECIAL THANKS," is "SB/HSR". In the in-game manual, page five, one of the instruction blips reads: "Press (square) to burninate with fireballs". An AI Character name is also called "Marsy Pants". A man in Hellfire Chasm says "This is private property. Trespassers will be burninated.". In Whisperwind Cove one of the items you obtain in one of the floors from a dwarf is called 'Witches Brew"
Both these areas were exclusively for the GBA version of the games, and were not on the original copies for the NES, or in the PlayStation remake Final Fantasy Origins on which Dawn of Souls is based. One of the possible names for the Dragoon class' wyvern pet is "Trognor". The flavor text when selecting the training dummy for the Nidhogg's Rage trial (which involves an elder dragon who possesses the body of a knight) says "He who harkens to rambling bard's ballad of man who was dragon man who was maybe just dragon obsessed with burning people and thatched-roof cottages is either great warrior or great fool." This preview mentions "Burninating the Players." One of the minigames is "Don't A Splode", which involves a car dodging boxes of explosives. One of the dragon decals players can put on their cars in the PSP version is called "Burninator". In one of the maps, rp_richland, in one of the houses, there appears to be a kid's room. On one of the walls is a crayon drawing of Trogdor burninating some people, as well as a cloud (which also has a single beefy arm) throwing a lightning bolt. There are two addons relating to Homestar Runner, known as the Pill Pack (An addon pack featuring Ragdolls of most of the characters) and a map (gm_freecountryusa). In the credits of this game, it says "Additional Thanks To: Strong Bad." As an Elementalist (a mage), one can acquire spells called "Mark of Rodgort" and "Rodgort's Invocation." Both spells cause a condition in which the target catches on fire. Rodgort spelled backwards is Trogdor. In the latest update, one can go on a quest to bring an evil Stone Summit dwarf a Cold One, which you create by adding ice to a Warm One. The legendary torch Rodgort references Trogdor and calls back to the spells from the original Guild Wars. It features a dragon head breathing flame, and unlike most torches, which are straight, is shaped like an S and a more different S.
There is a consumable item called a grumble cake, a long-standing running gag in Homestar Runner. When you turn on the "I Would Have Been Your Daddy" skull, one of the things a marine would say while dying is "Life... flashing... before my eyes... Johnson... you still owe me 5 bucks..." which may be a reference to the SBEmail army. In the level Foundry, in random piles of trash there are Chinese boxes with what appears to be Trogdor the Burninator. On Hat Kid's ship, you can find a computer. On this computer, you can start a simple text adventure. Near the end of the adventure, you have the option to "Go Dennis". A card features "Troggzor the Earthinator", originally from the World of Warcraft MMORPG, is ultimately a reference to Trogdor. Its flavor text is "He keeps earthinating the countryside despite attempts to stop him." One minigame, entitled "HOW JOO MAKE A'SPLODE? ", requires you to activate a bomb. One of the kits in the music app is called "Tandy 400". It is a common misconception that the hugely difficult freeware platformer I Wanna Be the Guy got its name from 1-Up's line in japanese cartoon (or even vice versa, even though said email predates IWBtG by nearly five years). According to the FAQ for the game, Michael "Kayin" O'Reilly is a fan of H*R, but came up with the name of his game for a different reason. One of the items you can purchase at the store is the Original Book. In this flash game by Kenney Altera, the in-game instructions warn that if the protagonist dog touches a mine, he will A SPLODE! The game can be found here at Newgrounds. In the Xbox 360 version of the game, an Achievement can be unlocked called "Asplosion", which is similar to Vector Strong Bad's "Asplode". When fighting the Hydra in the Colosseum, a reaction called Urninator will be available. Urninator is one letter off from Burninator. In the BradyGames strategy guide for the game, on page 28, there is a tipbox labeled "Everybody to the Limit", a reference to the song of the same name. The journal entry for the Tatsu Blaze uses the phrase, "Prepare for burnination". One of the ways to attack someone in Player vs. Player is to "Burninate". In The Barrel full of Barrels, if you break open an exploding barrel, the result text tells you "Your Barrel A Splode, hurting you. Badly". In the Strange Leaflet, an area inspired by old text-based adventure games, you can enter in "Dennis" to hear that "You cannot go DENNIS from here." In the chat function, the chat command '/baleet username' carries out the same effect as '/ignore username'. The game contains an item, Marzipan skull, which contains a reference to the character Marzipan and the food of the same name in the description. The game also contains a Mr. Balloon item, the description of which refers to Strong Bad's song about "the High Voice Crew" from helium. The description for the pirate zombie robot head contains the text "Must... fight... jibblies!" – a quote from More Fan Costumes. The description for the skewered jumbo olive says it has been "sworded". The descriptions for the eXtreme meat staff, sword, and crossbow say the respective weapon is "to the limit". The filename of the "100 Pound Load" Trophy is heavy_lourde.gif. One of the adventures in a drunken stupor has the text "You buffoon. You carpetbagger. She gives you whatfor", a variant on a quote from Old-Timey Strong Bad in 50 emails. Two of the combat messages from the spirit hobo refer to Senor Cardgage - the message about "low rates and percent signs" is similar to a quote from Senor Mortgage, and the message about a girl named Helvetica is based on garage sale, when Senor Cardgage refers to Strong Sad by that name. When spectating on the KWE wrestling matches in the KWE chatroom, the announcer has introduced Roo (who is basically a kangaroo wearing boxing gloves) with "How the heck does he karate-chop with boxing gloves on?" Giving a weapon to Roo in the KWE Back Room results in the message, ". . . holding this with boxing gloves will be the greatest challenge I have faced since that time I tried to type!" One of the Fun Facts on Roo's trading card reads "Roo never takes off his boxing gloves! It's a good thing he doesn't do much typing!" When fighting The Box, one of the attack messages reads "It boxes your ears. How does it box with typing gloves on?" When fighting a raging bull, one of the miss messages says, "He prepares to pummel you, but you confuse him by asking how he can do that with boxing gloves on." The entry for the boxing glove reads "How do I type with these things on? The better question is how will you repeat that question after I knock all your teeth out?" In The Hidden Temple, one of the events is entitled "Arrowed!". One of the gambling events in the Money Making Game involves shooting an arrow into a papaya à la William Tell. If you hit the papaya, it is said to be "arrow'd". One of the Valentine's Day gifts is an arrow'd heart balloon. One of the KWE wrestlers, "Chori Zo", has "Lady-type" for her gender in the KWE Fact Book. When fighting a scary pirate, one of the miss messages says, "He moans "brrraaaiiiaaarrrnns!" and starts to gnaw on your skull, but does a pretty lousy jeorb." When fighting a mayonnaise wasp, one of the miss messages says, "It tries to coat you with nasty mayonnaise, but you counter with a ketchup bomb." The image of the star shirt resembles Homestar Runner's shirt. One of the stench resistance tests in the Daily Dungeon contains the text "or as I like to call it, 'Rotten Eggland'." One of the spooky resistance tests in the Daily Dungeon uses the phrase "the jibblies". Before The LAAAAME Observatory was destroyed by part of a comet, one of the galaxies you could observe was called, "Distant Galaxy NGC-404." The filename of the image was, "404d.gif". If the Scroll of ancient forbidden unspeakable evil causes hot damage to you, the game says, "These things are bad for you", perhaps referring to Homestar's line from invisibility. Sometimes, when you consume a Fancy but probably evil chocolate, it can be "filled with some sort of witch's brew, or perhaps witch's brüe", referring to both Witch's Brew and Halloween Fairstival. Starting June 25, 2007, when you use the new item Black Body Spray it states that "You feel moxious and dangerous, but it's hard to operate when everyone is trying to get all up ons." The description for the Fire-breathing duck contains the line "the important thing is that somebody gets this freakin' duck away from you," a reference to In Search Of The Yello Dello DVD and Main Page 13. While fighting a War Hippy Airborne Commander, one may get the effect "All Covered in Whatsit". The description for the fire item mentions it could be used for "blending in at a peasant convention," a reference to Trogdor burninating peasants and/or Rather Dashing having to make himself "on fire like a peasant" in Peasant's Quest. In Hobopolis, if you have Richard make nine scarehoboes at Richard's Redoubt, he says "I can do it! I can do it nine times! ", a reference to the Strong Bad Emails crazy cartoon and virus. Also in Hobopolis, some of the Hobo Names are references. One of the titles for a Hot-aligned Hobo is Burninatin'. One of the occupations for a Stench-aligned Hobo is The Poopsmith. One of the nicknames for a Spook-aligned hobo is "Gives you the jibblies. The Slime-covered Speargun mentions a Nunchuck gun. The Thermos of Brew is stated in the description to be full of Witches' Brew. In addition, the consumption text contains the line "You dwink the witches' bwew", a reference to Homestar Runner's speech impediment. When your army wins a battle, one of the phrases is "You burninated the enemy!" Likewise, when your army is beaten, one of the phrases is "The enemy burninated your army!" Kings of Chaos. One of the random monster names in Luminous Arc is "Asplode". At one point, one character says "First off, I'm not human, I'm a dragon. Or a dragon-man. Or something." When the main characters have reached the planet of light, Nova, one of the Dancing Fruit will at one point run by the party, screaming "A-splode!!" The runes around the spawn points are Norse and, when flipped backwards, read "Burninating the countryside burninating the peasants Trogdor." One of the ProTags in the game you can unlock in Monday Night Combat is named "Burninator". The music that plays during the intro is a MIDI of Stinkoman 20X6's level 1 theme. At one point, Vector Strong Bad appears and delivers his phrase, "YOUR HEAD A SPLODE". One of the available designs for a Craftsman Truck paint scheme is called "A-splode". If you click on the i sign at the 4th scene, the Wheat Grows Sweet noise from Peasant's Quest will play. When Nicholas speaks to the guard in Morth's castle, he says, "I say there, monstrosity! ", a clear reference to animal. Later in the dialogue, the guard says back to Nicholas,"It serves you right, stupid pfargtl! ", an obvious reference to Sbemail 169 Deleted Scene. Nicholas refers to a pile of refuse as whatsit in the sewer area. An Osu! player usernamed Agent Spin Here made a beatmap of the song 2 many knives. Upon finding the Red Minion Hive in the Nordberg Sanctuary, Gnarl comments that they are the "Burninators" of the Minion army. Near the end of the Gogekko Tower level, Orson asks Pac-Man to hack into a computer, to which he replies, "It's not easy to type with boxing gloves on." 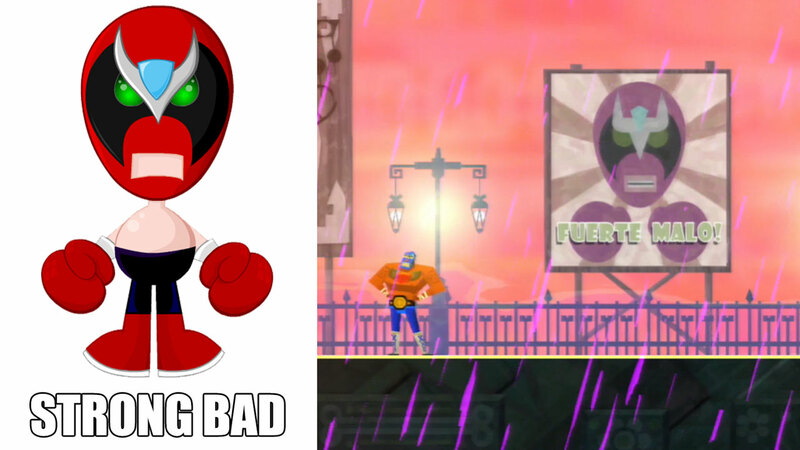 A picture of Strong Bad (along with Max, Tycho, and The Heavy) can be seen during the intro. On the AddictingGames page, at the end of the description of the game, it says "Do you has?" In a minigame in the Postal 2 add-on A Week In Paradise, when you look to your left after you start, the "POMx2" wallpaper can be seen used as a wall texture. When you go out of the lane, a billboard above the Postal Dude displays the Homestar Runner "Seriously." wallpaper. Also, next to a clinic in the minigame, is the Homestarmy poster. Inside the clinic, a boombox can be seen playing Everybody To The Limit. When your character dies in the game, death messages are displayed. One of them is "Your head a splode!" Losing all your lives displays the message "YOUR SHIP A SPLODE". In episode 5, Chippy's bleeps are transcribed as "preeyow". One of the levels, a right-pointing arrow, is entitled "Arrow'd". In the Xbox Live Arcade title Shadow Complex, the achievement for getting a certain number of headshots is called "My Head A-splode". One of the Bosses is named Dagron (Massively Misspelled Monstrosity), possibly in reference to Strong Mad's "drawing" in dragon. At one point, the hero can tell someone that Yuzu Tanikawa is another character's ladyfan. In one scene, Yosuke Hanamura claims that fish give him the jibblies. And during the sequence of events that leads to the True Ending, he also says that the case is over for reals this time. One of the appliances is called "StinkSmasher 20X6." There is a decorative flame-thrower called "HottCorp Burning 8-R Series". The catalogue description makes reference to a dragon. One of the Trash compactors is named "The comPRESSOR". During the credits, zoom in on Slacker's nametag to see a picture of Homestar on it. A hidden picture of Strong Bad's head exists within the game's files. Its purpose is currently unknown. One of the default name choices at the beginning is "Homsar Dell". You may need to click on the button again many times to come to this name. Kerrek will show up as well. When the Firebat unit is clicked on multiple times, one of its responses is "Burninating the countryside"
In the Museum ending of The Stanley Parable, there is a room in the museum that shows fan emails for The Stanley Parable, one of which is addressed to Strong Bad, with the classic "How do you type with boxing gloves on?" question. In this flash dice game on Facebook, you can find a "Sporty Runner" Egg as a prize. It is painted red with a white star and the top is blue, imitating Homestar's outfit. In this flash game a secret item is Homestar Runner's hat and shirt/pants to put on Mario. Already visible are Homestar Runner and Strong Bad's Shoes. For secret character Frank West's "Dead Rising" combo, he tosses the enemy in the air and whacks with a baseball bat into the sky. He either says "Dead Rising!" or "To the moooon!" which could be a nod to personal favorites. In the Vans Park level, go forward from the starting point, then spine transfer the side of the half-pipe to the quarter-pipe on the other side. If you land it, you get the gap called "WIIIIDESCREEN", a reference to flashback. In the Vans Park level, if you grind a rail around the corner on the third floor and jump out of bounds, you will see one of four messages, "Children'd!" "Arrowed!" "MSG'd!" or "Late 360 Shove-It to Boneless'D!" You can also see these messages by using a trainer to increase your ollie or air height and jumping beyond the level's "ceiling." Also in Vans Park, if you board whack the generator thing, you will get a message and respawn. One of the possible messages is "Your head asplode". One of the cheats for the game is "2them00n," a reference to personal favorites. When playing online, if you collide with another player, one of the messages is "You just K.O. 'd 'the name of the person you just collided with'". This is a reference to Teen Girl Squad. In the Moscow level, if you jump into a certain chimney, you die and the screen gives you a message. One of the messages is "BURNINATED!". In the Vancouver level, when you drive the limo, the license plate on the back of it says "LIMOZEEN". If you manage to set an enemy on fire, you will be awarded with a burnination combo. In this flash game on Addictinggames.com, whenever you lose with a good score roughly around 10,000 the words "Good Jorb" appear on the screen. Q: Who is Strong Bad's chronically depressed brother, in the web cartoon "Homestar Runner"? Two of the game's items are the Deathly Pallor mask and the Burninated Bush decoration, references to Strong Sad and Trogdor respectively. In the Battleverse, the game's PvP mode, one of the kill messages is "(victor) explodinated (victim)," another Trogdor reference. One of the game's Steam achievements is called "Burninate the Hydrakken!" This is yet another Trogdor reference. When you're fighting Shifty Sam, one of the hit messages says "He blurs so fast that he actually turns invisible. You'd think he'd use that ability to go steal some cake rolls, but he uses it to hit you. A lot. ", a reference to invisibility. One of the Xizzles you can get is called "All up ons", which is a reference to suntan. The detail text for flamethrower gas cannisters reads "A cannister of Burninator-brand flamethrower fuel", an obvious reference to Trogdor. When Prince Kael'thas Sunstrider & the Blood Elves are captured & held prisoner within the enchanted dungeons of Dalaran, one of the pair of guards taunting Kael is named Trogdar, a subtle reference to Trogdor. Also, in "Extreme Candy War 2005", a bonus map produced by Blizzard themselves, a neutral shop sells "Extreme Warez", one of which is a power-up that doubles the number of troops in the next spawning for your faction; this power-up is aptly named "TO THE LIMIT!" A character named Master Smith Burninate appears in this game. He is an NPC at Thorium Point who gives quests. His name is yet another reference to Trogdor, who "burninates" the countryside. In the Goblin Town, Ratchet, there is an ogre NPC whose name is Jorb. Also, there is an ogre named Chort outside the Blade's Edge Arena, another word mispronounced by Coach Z. Also, Homestarrunner.com appears in the "Additional Thanks" section of the credits. In the WoW Collectible Card Game, a card in the "Onyxia's Lair'" raid deck is called "Burninate". It features the flavor text "Suddenly the lair was aflame, everything burning like thatched roof cottages." In Cataclysm expansion there is a quest in the Deepholm zone (the elemental plane of earth) to kill a large Trogg general named Troggzor the Earthinator. Doing so earns you the choice of three rewards, such as Earthinating Peasant Leggings. The Oracle: One of the possible answers is "Outlook equals very yes". One of Riki's special arts is "Burninate". There's also a "Freezinate" art. "Strong Bad and Friends" are thanked in the "Special Thanks" section of the End Credits. On the web version of You Don't Know Jack, in episode seven of the weekly Jack game, during the "Jack Attack" the name Strong Bad appears. Players have to match the given phrase, word, object or person to something else based on a clue. The clue for the game is 'Who's Your Unintelligible Friend?' and the correct match of The Cheat eventually appears. Strong Sad also appears as an incorrect answer. This page was last modified on 4 January 2019, at 16:53. This page has been accessed 225,904 times.